It has been 6 months since I bought my sulcata hatchlings for sale from TT. I waited this long to write my review after quickly finding out (after I bought him) that most hatchlings don’t survive long due to improper husbandry by the breeder as well as the whole ordeal of being shipped. I am happy to say that my baby is healthy and thriving at 7 months old, and when I contacted TT to get his exact hatch date a month after buying him (vet wanted this info), they were able to answer right away. 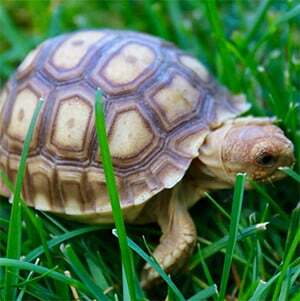 I love my new baby tortoise so much and wouldn’t trade him for anything! https://www.tortoisetown.com/wp-content/uploads/2016/08/sulcata-tortoise.jpg 301 300 Tortoise Town https://www.tortoisetown.com/wp-content/uploads/2016/08/image-1-300x103.png Tortoise Town2018-04-02 10:01:332018-05-07 12:53:22The best African Sulcata tortoise hatchlings for sale online! Love my Yellow Foot tortoise from TT The best red footed tortoises for sale!